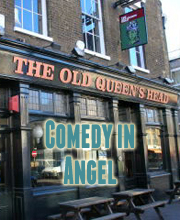 A top comedy night one of the best venues in London – the Camden Head in Camden. Venue address is 100 Camden High St London Borough of Camden, NW1 0LU. One third of acclaimed sketch trio Sheeps (Kitson’s a fan”), and one of the most exciting prospects in UK stand-up in his own right, former Cambridge Footlight Williams is a smart, witty and erudite performer. He’s been named One To Watch by TimeOut, and was runner-up in both So You Think You’re Funny? and Amused Moose Laugh Off 2010. He’s just live-tweeted Mark Watson’s 25 Hours for Comic Relief and been nominated for Best Newcomer in the Chortle Awards, and the future is looking even more exciting for Hess. Norwegian comic Dahle was a finalist at So You Think You’re Funny 2012, and won the first Squawker New Act of the Year.